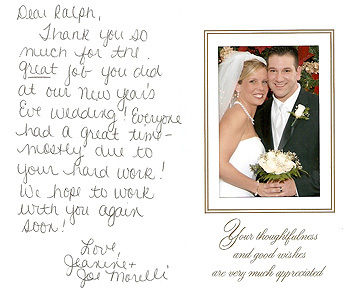 "Thank you so much for the great job you did at our New Year's Eve wedding. Everyone had a great time - mostly due to your hard work! We hope to work with you again soon!" "We would like to thank you for your services at our wedding. You helped to make our special day the one we always envisioned. Everyone has been raving about how fantastic you were. You really know how to make a crowd get up and dance. Thank you so much for all your hard work." 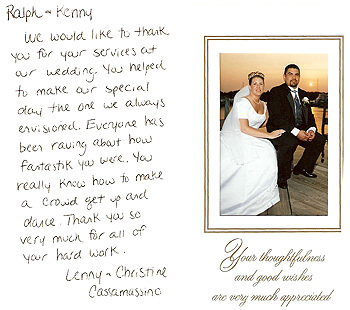 "We cannot thank you enough for making our wedding perfect. You did such a great job & we received so many compliments on you. 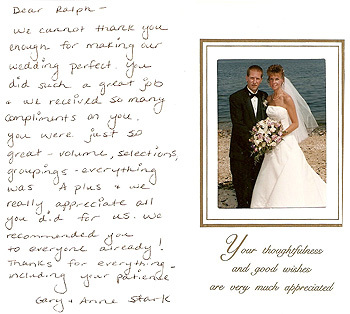 You were just so great - volume, selections, groupings - everything was A plus & we really appreciate all you did for us. We recommended you to everyone already! Thanks for everything - including your patience." 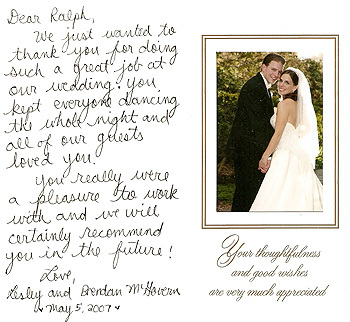 "We wanted to thank you for doing such a great job at our wedding. You kept everyone dancing the whole night and all of our guests loved you. You were a pleasure to work with and we will certainly recommend you in the future."